June 10, 2010 By Paul Mayer & filed under Buying Advice, Product Review. OK, let’s start with full disclosure; I enjoy hand planing more than almost any other activity in the shop, and I have lusted over Lie-Nielsen hand planes for over a decade, but I haven’t purchased one until now. Why? Two reasons. First, they cost more than most hand planes on the market, and I am thrifty. Second, I get a huge satisfaction over finding quality hand planes at garage sales and flea markets, and tuning them to peak performance. When I do this, my ego wants to believe that the plane will now perform as well as any high end plane that I could buy, even for 5-10 times as much money, and another part of me has been afraid of what I might find if I ever put this theory to the test. Well, Jack Nicholson, I have decided I CAN handle the truth, so let’s find out if a hand plane can really be worth $350. To understand this tool, first it is important to understand a bit about Lie-Nielsen Toolworks. In 1981, Tom Lie-Nielsen set out to revive designs of tools that were high quality, effective tools in their day, and even better than many of their modern day equivalents. Those old tools were still in high demand, and were deemed by many to be superior to most tools that were currently on the market. Due to increasing demands of high quantity and low cost, many modern toolmakers manufacture off-shore, using economical materials and highly automated processes. Tom Lie-Nielsen set out to attract the passionate tool enthusiast by building tools locally with only the finest grade materials, and hand crafting each tool with a small number of artisans, with a level of detail that would match the detail within the projects that his discerning customers would make with the tools. Mr. Lie-Nielsen’s strategy has proven viable, as Lie-Nielsen Toolworks has become a recognized icon of high end, quality hand tools. Lie-Nielsen manufacturers a full range of planes, from block planes through a massive #8 jointer plane. I chose the #4 because I have found that size to be the most versatile, and the one that I reach for the most. I use a #4 for anything from flattening rough stock, to flattening a glued up panel, or even flushing a rail/stile joint if I don’t have a block plane handy. A review of the Lie-Nielson product lineup indicates that some of the plane bodies are ductile iron (an optimized alloy that offers greater resistance to cracking than traditional cast iron), and some are manganese bronze, an alloy that offers superior strength and hardness to brass and softer bronzes. Choosing manganese bronze adds $50 to the price of a #4 plane, so what is the advantage? Manganese bronze is a strong, hard alloy that won’t rust, and is even less prone to cracking than ductile iron (both options are superior to traditional cast iron plane bodies, which are notoriously prone to cracking and oxidation), which you will appreciate if you ever drop it on a concrete shop floor. It is also heavier than iron, which I consider a benefit when I am using a hand plane, as it promotes chatter free removal of stock. Plus, it’s just plain gorgeous, which I suspect is the real reason that many people choose that option. My initial impressions of the #4 plane were around its appearance. It was even more beautiful than it looked on the web site. It captures the bold, durable appearance of the Stanley Bedrock planes which were produced from the 1890s to the 1940s, but with a manganese bronze body and cap iron, as well as several other bronze components, it is even more striking. Add to that a cherry handle and knob which have been hand sanded and finished to a lustrous glowing appearance, and you have a hand plane that is truly a work of art. As I inspected the outer surfaces of the plane, I found no sharp edges (other than the blade! ), as everything is gently beveled for comfort. This is due largely to the fact that each component is carefully detailed by a human being, and each bench plane is inspected at multiple points of production before it is packaged for shipment. This is in significant contrast to large scale manufacturing where random sampling is commonly done to ensure quality for an entire production run. Then I removed the cutting iron, cap iron, and lever cap to get a closer look, and I marveled at the amazing fit and finish of everything “under the hood”. No slop in any of the moving parts. The fit between the cutting iron and cap iron was perfect, which is critical for consistent clog-free operation. Everything that is supposed to be square is square, and the flat surfaces are dead flat. The cutting iron is a full 1/8″ thick, and it is flattened and honed to perfection out of the box. Most planes that are sold today require some flattening and sharpening before they can be effectively used, so kudos to Lie-Nielsen for addressing this prior to shipping. The photo on left compares the Lie-Nielsen cutting iron to one found in a typical plane. The Lie-Nielsen iron is nearly twice as thick, which means a smoother operation and less chatter. 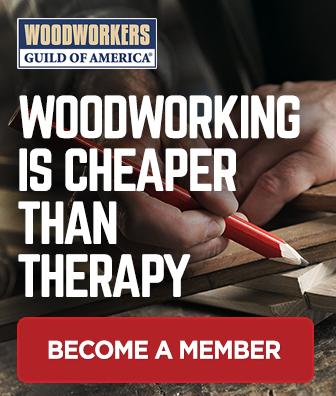 I am not beholden to any object simply for its beauty; especially a woodworking tool. For a tool to earn its place on my bench it needs to perform. So next, I put the plane through a few simple tests that I apply to any hand plane that I have tuned. First, planing on edge grain. Could I take a long, continuous thin shaving? Yes. No adjustment necessary; it did this right out of the box. Effortless motion that yields a beautifully translucent shaving so thin that I can’t measure it with my instrumentation. Bravo! 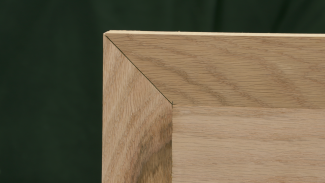 The next test was to plane at an angle across a glued-up panel, which is a common function for a smooth plane. What I am looking for here are two important things. First, can the plane cut through the glue line without any tear-out? Second, can the plane remove stock without leaving noticeable striping on the wood. This drives me crazy on some planes; even after careful tuning and careful beveling of the blade corners, they do not perform well at the second task, and therefore they do not get used much in my shop. The Lie-Nielsen performed superbly at both of these aspects of panel flattening. Effortless planing, and a smooth shiny surface without noticeable striping left behind. The final test; planing figured wood. I picked curly maple, which provides a great challenge and serves as a good litmus test for a hand plane. 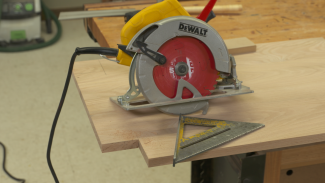 If there is any slop or vibration in any aspect of the tool, of if the blade is too thin or not sharp enough, the tool will gouge the figured areas of the board. Once again, the Lie-Nielson plane left a surface that was smooth and shiny, and easily passed this test. Pros and Cons. So far everything that I have mentioned has been a positive. In a meticulous inspection and some basic tests, I could not find any noteworthy weaknesses. I have heard that in some cases that as the bronze bodied planes age, they will leave some coloration on wood if the plane is not used regularly. This condition apparently can be remedied by either regular use, or with a periodic buffing and waxing. Other than that, the only downside is the hefty price tag. Given the workmanship and high quality materials, however I cannot debate that the plane is priced fairly at $350. I would not want Lie-Nielsen Toolworks to take any of the classic, short-sighted, spreadsheet-driven moves to reduce the cost of their tools. I hope they stay true to their high standards, using only high quality materials and employing an American artisan work force. There are many other hand plane options out there for the bargain hunter. Recommendation. Only you can answer the question of whether this tool is worth $350 to you, but what I can say with confidence is that this is the finest hand tool that I have ever held. It is clearly superior in quality, and surpasses in performance, every classic hand plane in my collection. 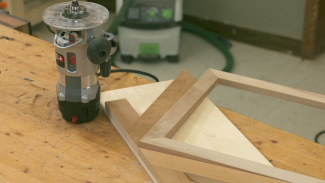 It performed flawlessly in all three tests; edge planing, panel flattening, and figured wood planing. If you want the best, and can justify the cost, you won’t be disappointed. If you want to save a few bucks, you might choose the ductile iron version of the plane. The additional benefits of bronze are nice, but may not be worth $50 to some. Interesting. but a little out if my ability to buy. After buying the Lie Nielsen rabbet block plane I find myself thinking why have I not got this sooner. The smoothing planes I have now even with replacement blades are ok but not great. I live in a highly humid, salt air environment where even stainless steel rusts. I would be interested in this plane for no other reason than it is bronze! I finally, after years or hesitation, bought the No.4. I can only hope it performs as wells as virtually every review of this tool indicates. Thank you for your review it was informative. Please buy and review the LN low angle jack plane set next!